What new PS4 games are coming out in August 2018? We're finally on the other side of the summer drought, and the release calendar is looking seriously stacked as a result. Try not to panic just yet, though, because this is the calm before the storm – you should see the state of September. 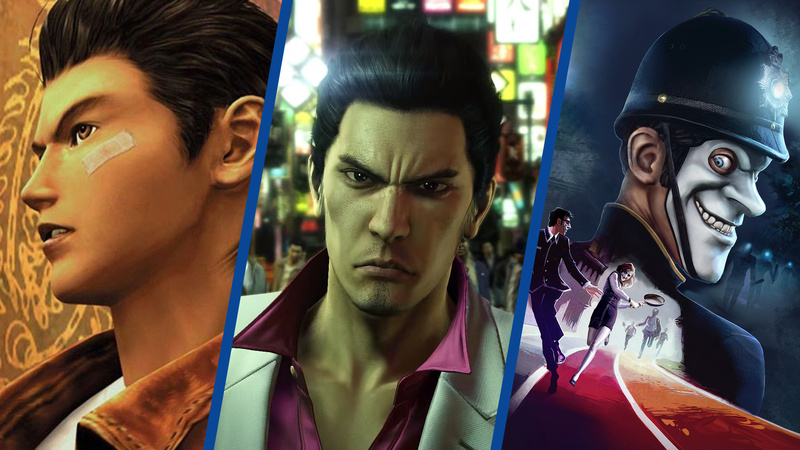 The biggest games this month include Madden NFL 19, Shenmue I & II, and Yakuza: Kiwami 2 – but Dead Cells and We Happy Few also deserve a mention. For a full list of launches, check out our 2018 new PS4 games release dates guide. What new PS4 games are you hoping to pick up in August 2018? Is there anything in particular on your radar? Register your interest in the comments section below. August is surprisingly strong this year. For me It'll be Shenmue and Fire Pro Wrestling. It's weird how everything just suddenly starts dropping from 21st August onwards. @ShadowWarrior You are already dead. Shenmue and Yakuza are the big ones for me. However, I might not get any of the new releases in August, as I've already bought some games recently, got a scary backlog, and I'm eyeing up some more games in the EU PSN sale, plus September looks set to be a big month for games. Death's Gambit and Original Sin II for me. Looking forward to both. Absolutely nothing I can't live without as I've already played Shenmue to death. My wallet can breathe easy until September. Sega are killing it in August. Shenmue Collection and Yakuza Kiwami 2 are must buys for me. Shenmue, Guacemelee and Yakuza? And that's only my must-haves for this month, still many more interesting games there. Nothing for me thankfully because September is going to be crazy. I will get The Walking Dead and Fire Pro Wrestling at some point tho. Nah im a madden nut, i've been buying it every year since Madden NFL 64 on the Nintendo 64. Its tradition. I buy Madden every year like people buy their Call of duties or Battlefields every year. Shenmue and Yakuza Kiwami 2 for sure! I'm going to wait until a sale for We Happy Few. I have a feeling it will drop in price fast. Shenmue and Yakuza back to back... Good times. Kinda interested in We Happy Few. I'm glad it's still coming to PS4 despite Compulsion Games acquisition by Microsoft, as I don't have a gaming-capable PC and I have no interest in an Xbox right now. Strange brigade has my interest. There's also a war hammer game I thought was supposed to come out, maybe it's pushed back again. just walking dead final season for me, though i'll probably wait til it's all available before getting it. having 1-2 hr episodes every 2-3 months doesn't work for me. Wow, not a single thing for me to play. Good thing Skyrim lasts forever lol. I was so excited about Divinity then I realized it’s turn-based and I turned off. @ShadowWarrior sounds like my Brother-In-Law. Guy only plays Madden games. Bought a PS4 solely for Madden and has since changed to XBOX because his son’s teacher runs a 32-person league that’s non-stop. I was once a Madden addict but I think 2012 is when it ended for me. I’ve become addicted to story-based fantasy/adventure games. Guacamelee 2 and Dead cells are my priorities next month, while I wait for Spiderman!! why do you care so much about what i do or "dont" buy ? first my comment on the Plus thread now here. Only care about Firewall and Dead Cells. Everything else getting a sale to wait on. Each years new Madden gives you instant access to play as the new years players that were picked in the NFL draft a few months ago. Also with the addition of Longshot mode you get a new story to play every year. And you also get new commentary. A really solid month, but my backlog is too big already. I will wait for Spider-Man. Guacamelee 2 and maybe dead cells for me. Also releasing in August - Blade Strangers (Aug 28th). Super packed months between Aug-Oct! We happy few is released next month? I didnt even know it was set to be released this year. I might buy it, but i'm kind of put off because if its good and they released i sequel, i'll never get to play it. Shenmue, Yakuza and not on the list WarioWare Gold. The calm before the storm, haha. @GKO900 Sorry, I couldn't find any official gameplay trailers for it. Only ones available are from YouTubers. But yeah, it's a 2D looking type fighting game. Also, it's not actually hand-drawn sprites but 3D models made to look like it. Nothing grabbing me for August, but OMG September has some great Black Friday games releasing! Grabbing shenmue, yakuza, and bullet girl phantasia! If it was one it would be PES 2019 but I may leave it a couple of months this time to gauge genuine opinion on the internet, rather than be swept along by paid-for reviews etc and end up disappointed. Couldn't they charge you once for Madden and make it a continued Online service? Provide yearly patches that add or subtract, and trade the players required? As far as the Story Mode in Madden there is only so many ways you can tell the same story. My original comment was if someone's wallet is being strained from the onslaught of games being released all at once, Madden seems like a series of games that you can wait a couple weeks on to help your wallet recover. Hm, plenty of games on the list I was originally planning to get, but I don't really feel like any of them right now. I'm hoping for some "unknown" Indie game to jump in. I'm only interested in these four games, but will probably wait a few years before experiencing them. 'The Walking Dead: The Final Season' is what I'm most looking forward to. I have a feeling I'm going to have to wipe my tears away. Also, 'We Happy Few' looks pretty interesting, so I could be tempted to pick that up at some point. Yakuza Kiwami 2, Shenmue 1-2, Overcooked 2, Death's Gambit, & The Walking Dead The Final Season are all gonna be mine!! I'm honestly interested in We Happy Few but I'll wait for reviews! I’d somehow never heard of We Happy Few. Very interested in that now. Good month but Divinity 2 is my most anticipated game since Persona 5 so that's what I need most in my life.